Ken is still feeling under the weather and his head is full of coughs and groans and not too many blog ideas so I thought I would pinch hit for him. I love to watch shows on home renovation and caught one called “Rehab Addict” where this women fixes up older houses, making them safe and livable while trying to ‘rehab’ the building to its former charm and glory. She does a wonderful job and the houses are now ready to be homes for some lucky people. The thing that struck me about this house is that she cleaned up the storm windows and added them as a feature to the house. Because the old houses had single paned windows, in the winter you would put the storm windows up to add a layer of window and air space to try to prevent heat loss over the cold winter months. In the fall you would bring up the storm windows from wherever they were stored, clean them up, re-caulk any panes that needed re-caulking and then attach them to the outside of the house, usually with wing nuts. 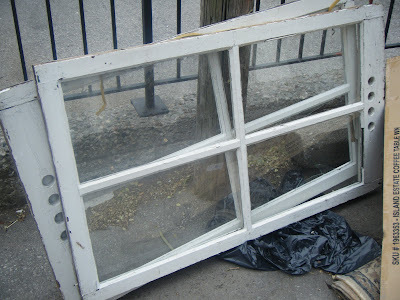 Then in the spring, the storm windows would be taken down and stored wherever they were stored for the warm months. I remember the ritual of putting them on and taking them off and am ever so grateful for modern windows, where this is no longer necessary. This set me off to remembering other things that everyone had and almost no one has any more. Percolators for making coffee is what came to mind next. I can smell the coffee as it perks thru the machinery and can still hear the ‘pop pop popping’ as the coffee was brewing and popped in the glass bubble in the top of the lid. You could use the percolator on a wood, gas or electric stove – a coffee maker for everyman. Of course everyman has their own idea of how much coffee one should put in the machine and how long it needs to boil for the perfect coffee. The next step in homemade coffee was the innovative use of the Melitta coffee system where you put a measured amount of coffee into a filter that went into a plastic holder that sat on top of your coffee pot. You boiled water and poured enough water to cover the ground coffee, which foamed up when covered with boiling water. You then had to wait a few minutes while the water filtered down and then you would add more boiling water, washing down the sides of the filter to make sure all of the grounds were covered again. I remember how amazing it was to watch the first time I saw it – even if I did miss the percolator sound letting you coffee was brewing. What a long way we’ve come from percolators to keurig and tassimo machines where you pop in a tiny container full of coffee, push a button and voila – you can have any flavour of coffee you want. Another thing that brings a smile to my face as I remember is the classic kitchen chair with fold-back stairs. We didn’t have one in our house but most people did and any time we visited a relative who had one, that is where I would head. As I recall, I would fold the stairs out and then would climb up and that the steps would fold back out of the way when not needed. As a child I thought those chairs were magical and I felt so special whenever I sat in one. And of course, whenever I was lucky enough to be sitting in this throne, I was usually treated to a home made treat from our hostess – how could I not feel special! Now people have breakfast nooks with various stools, but none as cool as the ones below! These are some of my memories – hope they jogged a memory or two in you.